Complete and partial dentures are removable devices that replace missing teeth. They can have a bad reputation as being ugly and ill-fitting, but well executed dentures can be secure, functional, economical and very aesthetic. Dr Giblin has received extensive training in dentures in the USA with some of the best Denture Practitioners in the world, giving him a unique set of techniques and skills. He sees many patients that are not happy with their current dentures. Through thorough assessment, he is able to either modify existing dentures or make new ones that are much more comfortable, aesthetic and functional! 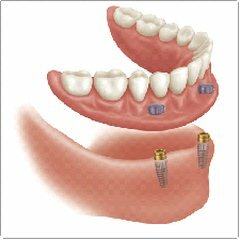 With the introduction of implants, traditional dentures can now be improved by bars or press-stud type of attachments that “anchor” the dentures down, while still being able to remove them for cleaning. With the low cost, ease of maintenance and aesthetics of dentures combined with the retention and stability of implants, traditional dentures (or “overdentures”) are a front line treatment again. We can often retrofit existing dentures too at minimal cost.